Keeping all those little bits and pieces you want on hand can be difficult, but Stephen James from Bundaberg, Qld, has a simple solution. 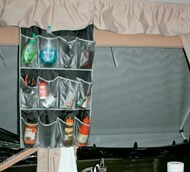 Stephen hangs a shoe organiser in his Jayco Dove camper trailer near the dining table, so he has easy access to sauces, salt and pepper, headlamps, wallets, glasses and more. With limited bench space it keeps the trailer clutter free. Stephen suggests getting one with clear pockets so you can see your items easily. As a secure way of carrying fishing rods, Stephen James from Bundaberg, Qld, added a hinge and small door to the end of the chassis rail of his camper trailer. He can fit three rods in it and, best of all, they are fully protected and away from prying eyes. 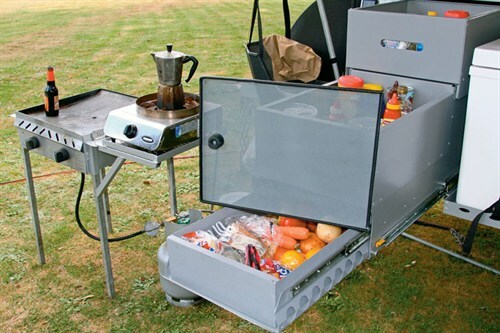 John and Anita Beer from Terrigal, NSW, created a removable shelf for their camp kitchen by cutting and screwing supports into the side of their camper trailer. The 1200x250mm aluminium shelf clips onto the brackets. Timber supports on the camper’s interior help support the load. The shelf rides next to the kitchen during travel. Rob Spencer from Mandurah, WA, modified the spare wheel carrier on his offroad camper to improve access to the storage below. The two 4.5kg gas bottles were replaced with two 3kg cylinders providing enough room for a small Honda generator stored in a leather bag. 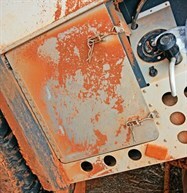 A hinge inserted in the base allows the wheel carrier to pivot, and the steel pipe sections inserted in the metal frame at the top are secured with locking pins. Greg Moore from Riddells Creek, Vic, has created a covered storage area from a jerry-can holder. Constructed from a scrap piece of metal trimmed to suit, the door connects to the guard using a piano hinge and secures using over-centre clips. The vessel is suitable for storing wood or keeping garbage away from foraging animals. 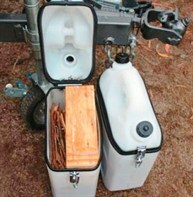 Bruce Ninnis from Oakleigh, Vic, adapted jerry cans so he could carry his firewood in the holders — an otherwise wasted storage space on the trailer. Bruce sliced the top of the jerry can and attached a hinge on one side and a latch on the other. Car seals on the cut edges conceal the sharp edges of the container and keep the contents dry and ready for use. The holders are great for kindling but will carry larger timber as well. “Of course, they can also carry anything you like that is needing extra storage capacity,” says Bruce. 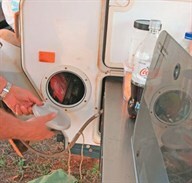 Russell Dent from Sale, Vic, used a boat porthole cover to improve access to the inside of his camper trailer. The narrow opening is used to store awning poles. The porthole and screw-on lid can be purchased from any boat store such as Whitworths. 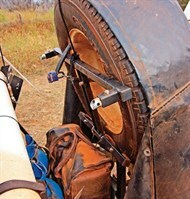 Neville and Rita Arnott from Lumeah, NSW fitted a pair of pole carriers under the rear of their trailer. The 100mm poly tubes, with locking end caps, carry all the poles for their external awnings plus their TV aerial without intruding on the trailer’s nosecone storage, interior, clearance or departure angle.